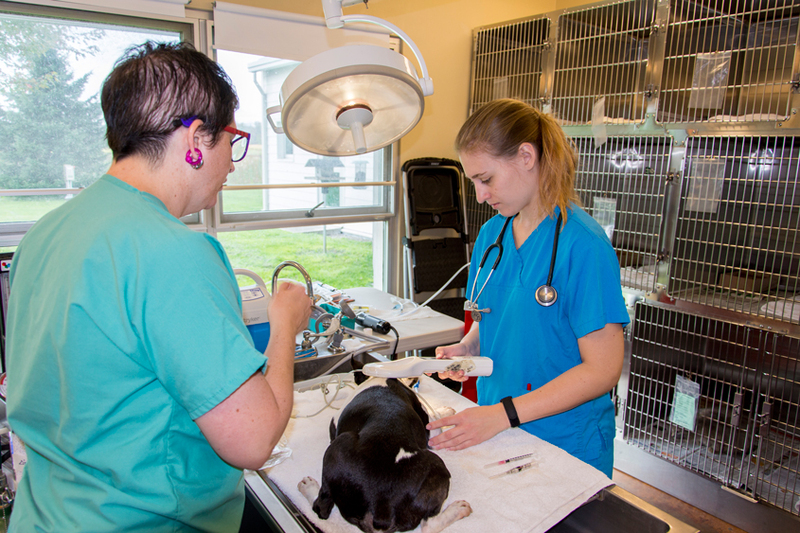 Despite their demanding academic schedules, our students are involved in a wide range of veterinary and non-veterinary extracurricular activities. Participation in organizations and clubs is an integral part of the student experience at the College. Participation in organizations and clubs is an integral part of the student experience at the College of Veterinary Medicine and provides an excellent opportunity for networking, making friends, developing leadership skills and/or learning about specific topics in veterinary medicine. The Student Chapter of the American Veterinary Medical Association serves the student body in several different capacities. It represents the national AVMA and publicizes the benefits of AVMA membership for the profession. The majority of their energies are directed toward operating a student government that addresses the needs of the College's students. The student government acts to identify and resolve any problems that may exist between the student body and the administration and aims to continually improve the quality of veterinary education. SCAVMA organizes social events for the whole school to attend, such as the Fall and Spring Picnics, the Auction to send students to SAVMA symposium, and receptions for the Dance Collective Showcase and Misster Cornell. SCAVMA officers are elected in the late fall and serve terms from January to December. The board consists of a President, a Vice-President, a Treasurer, a Secretary, one Class Representative per class, two Social Chairs, a Retail Committee, an Intramural Sports Chair, two Alumni Chairs, two Philanthropy Chairs, an IVSA Representative, two Public Relations Chairs, two Fundraising Chairs, a Webmaster, a GPSA Representative, the members of the Honor Board and the Curriculum and Admissions Committees, two NYSVMS delegates, and two SAVMA delegates. SAVMA delegates are elected for a two-year term, and they represent Cornell at the national SAVMA and AVMA conferences. The student chapter of the AABP serves to expose its members to the wide range of opportunities available in bovine practice. Lectures as well as hands-on wet labs encourage student learning and promote interest in the study of the bovine species. In the past, lectures have covered topics such as production medicine, nutrition, parasite control, dairy barn design, and DHI records analysis. Popular wet labs include dehorning, hoof trimming, and venipuncture. The AABP encourages anyone interested in cattle and bovine medicine to participate. The student chapter of the AAEP is devoted to presenting equine topics of interest to the members of the veterinary college. The AAEP offers activities designed to appeal to both those with very little equine experience and those who have been around horses their entire lives. The opportunity to learn/practice a variety of skills needed in equine practice is offered in wet labs which have in the past included: shoeing, venipuncture, vaccination, endoscopy, nasogastric intubation, teeth floating, restraint, lameness examinations, rectal palpation, prepurchase examinations, and joint injections. Lecture/discussion topics may include the presentation of research done by both Cornell faculty and those working outside the college, information sessions on new equine products, and other topics of interest, such as breeds and colors, race track practice, equine nutrition, the role of women in equine medicine and the relationship between veterinarians and farriers. The AAEP is a large and active club at Cornell. It exists to serve the needs of those students who might be interested in entering equine or mixed practices (or anyone with an interest in horses). Activities will be tailored to the needs of its members as much as possible. The Feline Club is the student chapter of the American Association of Feline Practitioners. Each year Feline Club sponsors speakers from around the country to lecture and give wet labs on specific feline topics. They also sponsor a fun cat show each year called "The Feline Follies". They run a volunteer project with the Tompkins County SPCA which entails weekly visits to the shelter to perform physical exams and FeLV blood tests. This club gives students a chance to get a little more hands-on experience outside the classroom. They sponsor such events as a physical exam review just before the first-years have their exam on the PE, a "Canine Capers" dog show, and numerous lectures from our faculty as well as speakers from companies and other institutions. Founded, in 1998, the Shelter Medicine Club's mission is to expose veterinary students to the myriad of issues surrounding animal sheltering and animal welfare issues. They conduct weekly visits to our local SPCA to conduct physical exam on shelter animals, giving students hands-on experience in shelter medicine while practicing their diagnostic skills. They host speakers on a wide range of subjects ranging from careers in animal sheltering medicine, humane animal handling, rescuing animals during disasters, animal behavior, and pet over-population. They often work together with other clubs on animal welfare related topics, and we'll also be hosting brown bag discussions on various issues. With one of the highest memberships in the veterinary school, our club welcomes all students who want to learn, have fun, and make a contribution to the community and to animals all at the same time. For those who don't have much experience with large animals, AASRP is a great way to ease into the farm animal world! AASRP is a club devoted to teaching students of all interests about the care of goats, sheep, llamas, and alpacas. Activities include various lectures on sheep/goat management, hoof trimming, sheep sheering, wet labs, venipuncture labs, and visits to local sheep, goat and llama farms. They welcome anyone interested in learning more and interacting more with small ruminants which are rapidly becoming more popular as dairy animals and as pets. ZAWS is the Cornell Student Chapter of the American Association of Zoo Veterinarians, and is the umbrella organization for the student chapters of the Association of Avian Veterinarians, the International Association of Avian and Aquatic Medicine and the Association of Reptile and Amphibian Veterinarians. Their goals are to further our knowledge of zoo, exotic and wildlife species medicine and to provide a forum for career guidance in this field. The club presents lectures and wet labs on relevant topics and occasional field trips to zoos, aquaria or wildlife preserves. In addition, they host a biannual "Special Species Symposium" featuring a wide spectrum of topics presented by renowned authorities in zoo, wildlife, exotic and aquatic animal medicine. The Student Chapter of the Veterinary Emergency and Critical Care Society is dedicated to providing greater exposure to the specialties of veterinary emergency and critical care. Their focus is in-depth lectures and hands-on wet labs giving students basic and advanced skills needed in many emergencies. In addition, Trauma Team allows students to volunteer in ICU and assist in emergency situations. The Cornell University Pet Loss Support Hotline was established in 1996. The hotline is staffed by volunteers, both veterinary students and other members of the Cornell community, who are trained by a professional grief counselor. Members regularly attend discussion meetings with faculty advisors who assist hotline volunteers in dealing with the personal responses to grief and educate them to better serve the needs of callers. Dealing with pet loss and grief will most certainly be a part of every clinician's job. The hotline not only helps those callers who are grieving over the loss of their pet, but it also helps us as students to become compassionate clinicians. Training sessions for new volunteers are held twice a year, at the start of each semester, so be on the lookout for posters announcing our introductory meeting. This program of animal-assisted therapy involves members of the Cornell veterinary community and their pets who make regular visits to local organizations such as BOCES and the Special Children's Center, Juvenile detention centers and retirement homes to work with residents. Animals used for visitation are licensed (dogs only), vaccinated, and free of external and internal parasites. They are given an obedience/temperament screening that evaluates how the animal relates to people, other animals, unfamiliar situations, and mildly noxious stimuli. In addition, training sessions are held for volunteers to learn about the principles and process of animal-assisted therapy and what to expect on a visit. VIDA is an organization aimed at furthering the interests of students who wish to work internationally. VIDA hosts presentations throughout the year from students who have worked abroad during the previous summer. It also hosts speakers from national organizations that fund projects involved in international veterinary medicine and animal health. The primary purposes of VOICE is to: a) articulate and promote the professional, academic, and personal needs and goals of multi-ethnic veterinary students, and b) promote and foster cultural diversity both in the veterinary college itself as well as in the profession as a whole. VOICE has a listserv that informs its members about cross-cultural events taking place around the university and current local, national, and international issues. It organizes guest lectures on a wide variety of topics, and social events such as ethnic potluck dinners and movie nights. Vets for Diversity (VfD) is an open organization where lesbian, gay, bisexual, and transgender members of the Cornell veterinary community and their friends and families meet occasionally throughout the semester for support and socializing. VfD also maintains communication with both the university's lesbian/Gay/Bisexual/Transgender Resource Center (LGBTRC), and the Lesbian and Gay Veterinary Medical Association (LGVMA), a national organization of veterinarians, veterinary students, and technicians. UltraSound is the vet school's very own a cappella singing group. For the past four years, UltraSound has been providing a creative outlet for singing enthusiasts. There are no auditions and rehearsals are held once a week for two hours. Their repertoire ranges from contemporary tunes by Billy Joel, Doran Doran, and Van Morrison to Doo-Wop to Jazz. UltraSound has performed at several college functions. The purpose of the CUCVM Dance Collective is to bring together the dance community within the Cornell University College of Veterinary Medicine by celebrating our enthusiasm for art, music, and dance. As a non-audition based dance group open to students of any level and style of dance, we serve as a creative outlet for students who would like a fun and casual way to express movement and meet others with similar interests during our bimonthly open classes. In addition to this, the CUCVM Dance Collective also offers performance opportunities to those students who would like the chance to choreograph and perform. Such opportunities include our annual Spring Showcase, which provides student choreographers a venue to present their work to the entire community. Welcome to the only veterinary college with an active theater company. The Cornell Veterinary Players is a combination of students, staff, faculty and friends who have a penchant for theater and enjoy having a good time. They organize every aspect of a musical production, from lights to costumes, from set building to make-up, from singing to dancing to playing in the pit orchestra. After a string of popular musicals, they performed their first ever musical revue, Broadway Unleashed, in the spring of 2000. Auditions take place in late fall and performances usually coincide with the vet school's Open House in April. The Veterinary Players is a great way to have fun, take a break from academics and meet new people. The Alpha Chapter of Phi Zeta was established in 1925 as the first chapter of the Honor Society of Veterinary Medicine. Chapters have now been established in all veterinary colleges. The purpose of Phi Zeta is to promote, acknowledge, and reward scholarship in the profession of veterinary medicine. Membership includes students and faculty. Third-year students ranking in the top 10% of the class and fourth-year students ranking in the top 25% of the class are invited to become members. In the past, the Alpha Chapter has sponsored research poster competitions and a book drive to send textbooks to third world veterinary schools that don't have many books for students to use. Both active and honorary faculty memberships are available. Phi Zeta sponsors both a local chapter and national post-graduate manuscript competition annually. An annual banquet is held each April to welcome new members. Each year, the Alpha Chapter recognizes the highest ranking second-year student at the Honor Day Banquet in May with the annual Phi Zeta award. OTS is the largest coed professional veterinary fraternity at Cornell University, and serves many valuable functions for members. It provides a social outlet for stressed-out students, throwing parties throughout the year. In addition, OTS is a great way to meet members of other classes, which is often not so easy due to everyone's different schedules. Finally, and most importantly, OTS allows students to get out into the community with various philanthropy/community service projects each semester such as our regular blood drives ad our annual Charity Ball. The Omega Tau Sigma (OTS) house is located at 200 Willard Way and up to 12 members can live in the house. The Southside Community Center Healthy Pet Clinic is a community service program that is organized to provide fee-reduced, healthy-pet veterinary care to individuals who could otherwise not afford these services. It also provides veterinary students with the opportunity to develop client communication skills, to practice the physical examination, and to become familiar with vaccination protocols and other aspects of routine pet health maintenance. The project is arranged through the collaborative efforts of the Southside Community Center, the staff of the Community Practice Service (CPS), and the veterinary school's student body. Since November 1996, Southside has provided veterinary services on the second and fourth Wednesday of every month by appointment. Southside also runs a healthy pet clinic each fall and spring in varying locations around New York State. Currently Southside provides vaccinations and addresses basic health maintenance issues such as deworming, nutrition, dental care, and flea control. The Cornell Raptor Program is sponsored by the Animal Science Department, and is another area of involvement for interested veterinary, graduate and undergraduate students. Opportunities at the Hawk Barn include evaluation and pre-release training (live prey training and flight exercise) of raptors treated in the Wildlife Clinic. Additional opportunities include reproductive research, captive breeding of raptors, and public education programs involving raptor conservation. Ever wonder how you'll find your first job as a veterinarian? How you will balance work and home? How you will find a summer job? How you are going to haul yourself out of debt? Whether you should become a specialist? VBMA was founded specifically to address "any issue vaguely related to money." The club's goal is to to educate fellow students on the "other" aspects of being a veterinarian such as finances, practice management and career exploration. Open House is a day-long event held each April that is run by students. Exhibits and information booths are set up to educate the public about animals in general, pet care, wildlife, and just about anything else that related to veterinary medicine. The Open House Committee is composed of second-years, but the responsibility to prepare and staff the exhibits falls on the first-year students. Popular attractions include the painted horse and cow, large animal exercise treadmill, cow milking, baby animals, and many others. There are already posters and other materials available from past years, but anybody with a particular interest is encouraged to design a new display. Open House attracts thousands of people from the surrounding area. It is a great public relations opportunity for the College and the veterinary profession. The public is enthusiastic about the exhibits and enjoys learning and interacting with the students. If your family and friends are looking for a special time to come visit, recommend Open House weekend. For additional entertainment, the Veterinary Players usually hold their annual musical on Open House weekend. Guiding Eyes for the Blind at CVM (GEB@CVM) provides Cornell Veterinary students and affiliated members of the veterinary community (faculty, staff, graduate students) with training and direct experience handling, puppy sitting, and raising guide dog puppies in pre-training for Guiding Eyes for the Blind. GEB@CVM works closely with our sister undergraduate organizations to support the socialization of the puppies on program in the Guiding Eyes for the Blind Finger Lakes Region. By connecting the CVM community with GEB, we aim to promote awareness of the human animal bond and experiential learning of applied canine behavior through positive reinforcement training of future guide dogs. This link also serves to provide valuable skills and networking opportunities for veterinary professional development in relation to non-profit service animal organizations.